Look super hawt when it's cold outside in this cute cropped jumper in black. 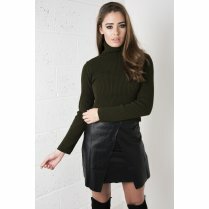 With a soft ribbed knit and flattering turtle neck, this is a style staple every girl needs in her wardrobe. Pair with high waisted jeans and ankle boots for chilled out 90's vibes.